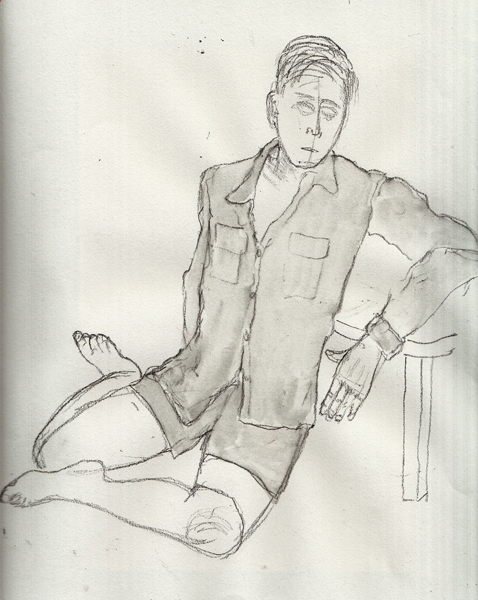 I am going to a Wednesday afternoon figure drawing session on Wednesday afternoons during February and March. I haven't done any figure drawing since October and sketched John on drawing paper (not watercolor paper) with a soluble graphite pencil and water. The shadows are due to scanning the slightly buckled paper. 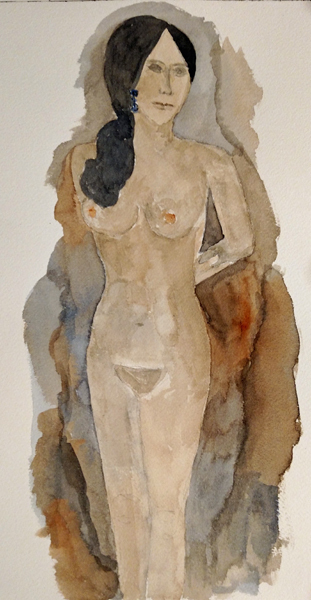 I then went directly to my evening Illustration Class at FIT (Watercolor Comps and Illustrations) and was delighted to learn that we had a model to start our series of classes. 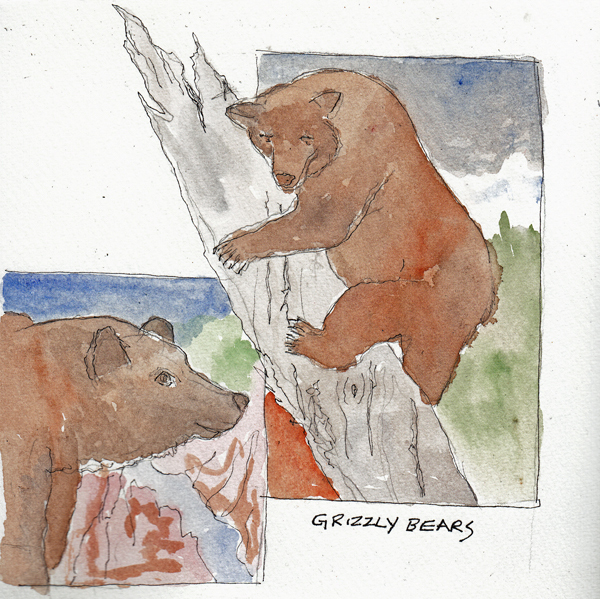 Our Professor demonstrated his method of watercolor painting and mixing colors on the paper. 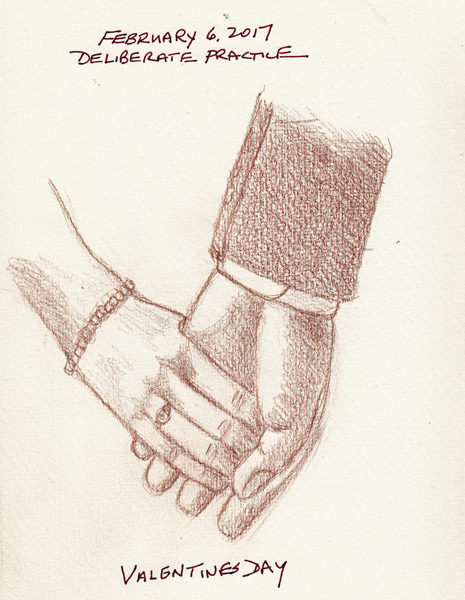 I use "deliberate practice" to learn how to draw hands. This is a slow process, I even drew all of the photo images from an American Sign Language website several years ago. Now I keep a pile of photos cut from advertisements in glossy magazines, and try to draw a few each month. 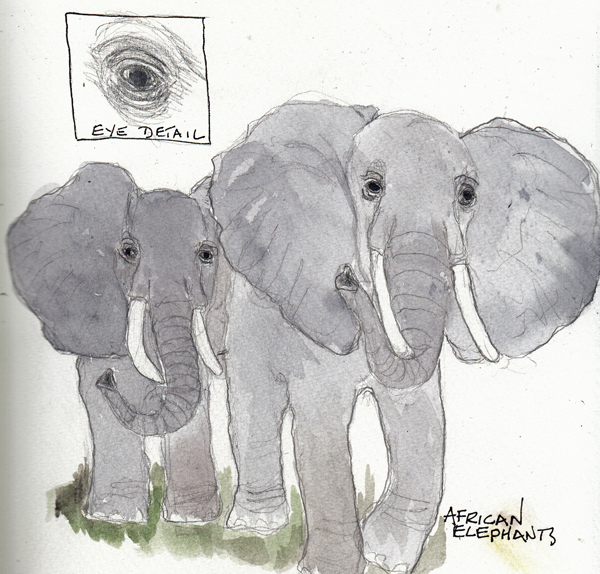 The three drawings below were drawn with a Caran d'Ache Mahogany Watercolor pencil, without adding water. 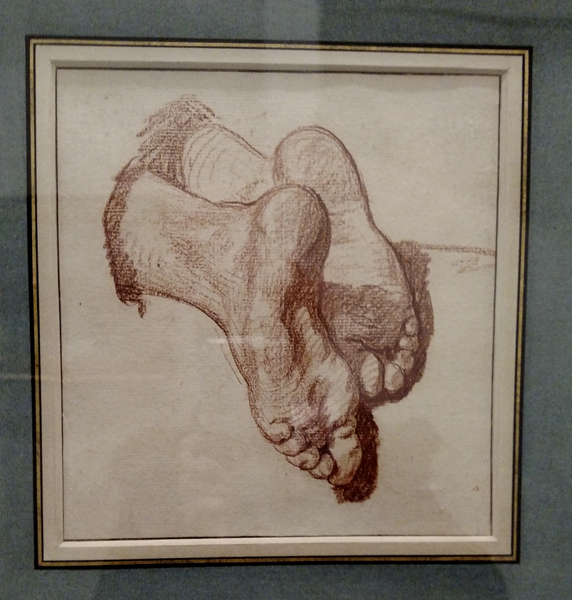 It most closely resembles the Master Drawings that I see in exhibits and museums, but is a pencil which can be sharpened for smaller sketchbook drawing. 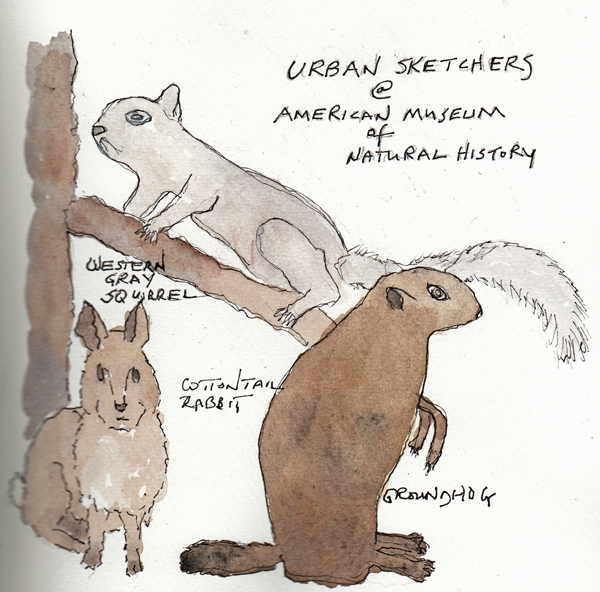 Yesterday was my first sketching session with Urban Sketchers - NYC in a long time and we met and sketched at the American Museum of Natural History here in NYC. In honor of Groundhog day most of us sketched the groundhog - and then moved on. There were approximately 20 of us at lunch and sharing our sketchbooks. Fun Day! 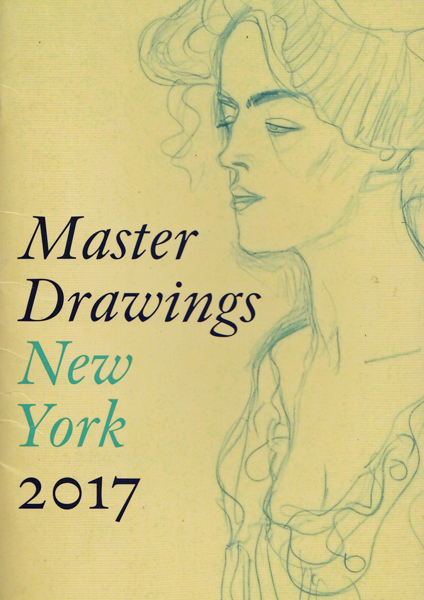 This is the book created for each annual Master Drawing week. It can be requested from the website and arrives in the mail at least a month before the event. Each gallery has an entry and there is a list of participating Galleries as well as a map on the back cover. The variety of elevators in the Upper Eastside Townhouses is part of the fun of this annual gallery-hop. 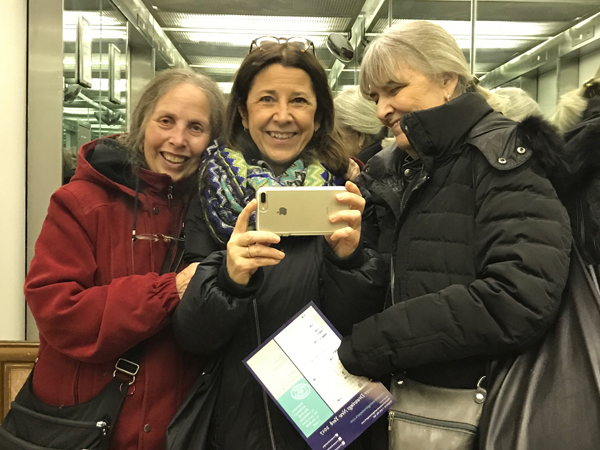 Benedicte, Pat and I took this photo in an elevator lined with mirrors. And here are a few of my favorite drawings. 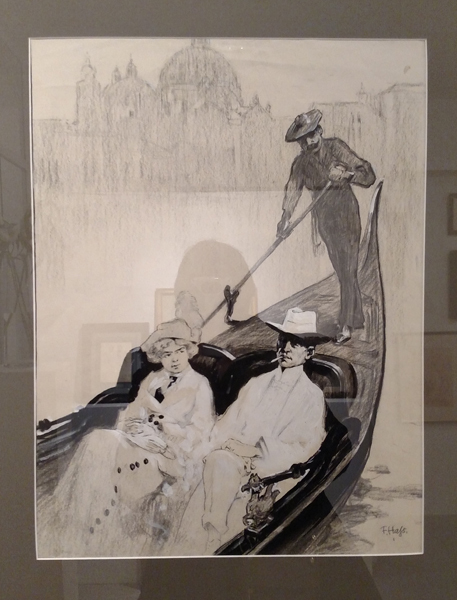 Fritz Haas (1864-1930): On The Grand Canal. We are returning to Venice in May, so this may be my favorite drawing of the entire day. 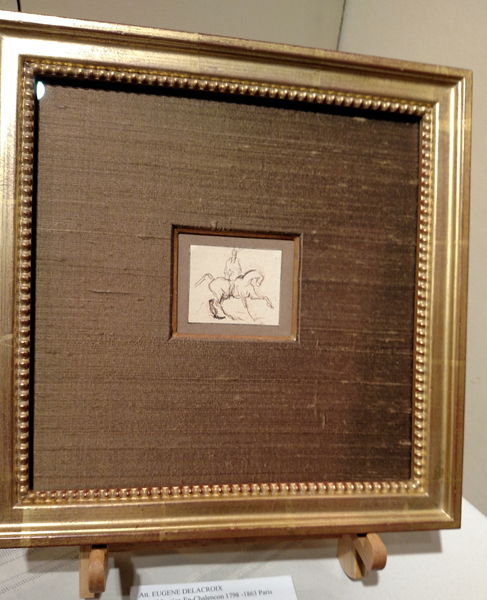 Eugene Delacroix (1798-1863): Chevalier au Cheval. 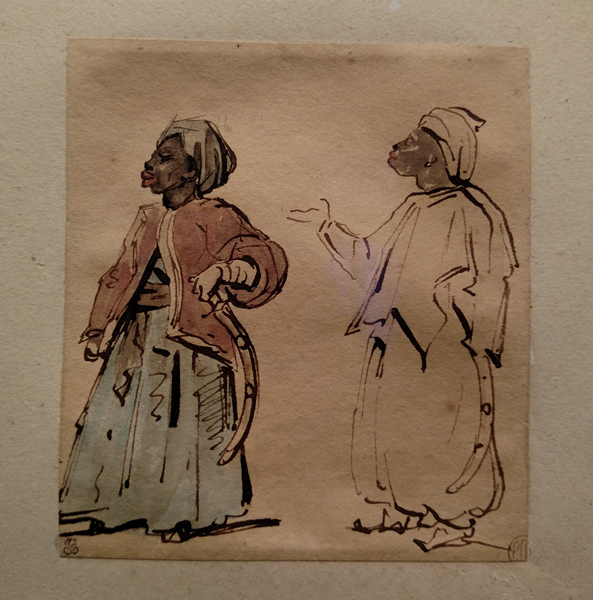 I love Delacroix drawings, especially from Morocco, but this may be the most expensive drawing of the day per square inch? $4200 for a 2 X 2" drawing. 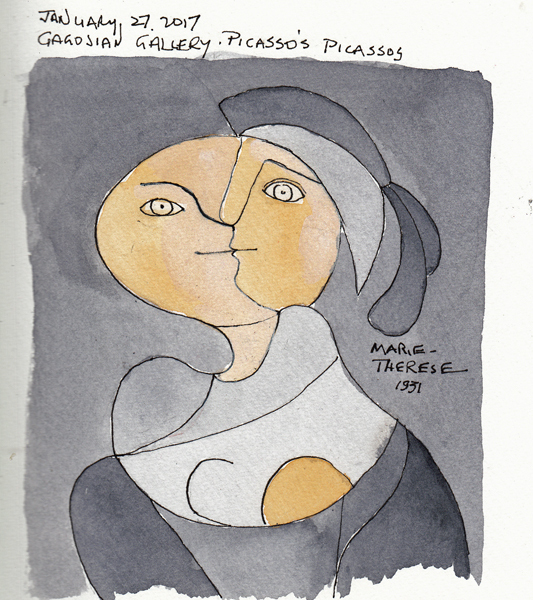 As we passed Gagosian Gallery, we stopped in for a quick look at the exhibit "Picasso's Picassos", that was extended to 2/17. These are paintings from his daughter Maya's Collection. We each sketched one - this is Maya's mother Marie-Therese Walters. 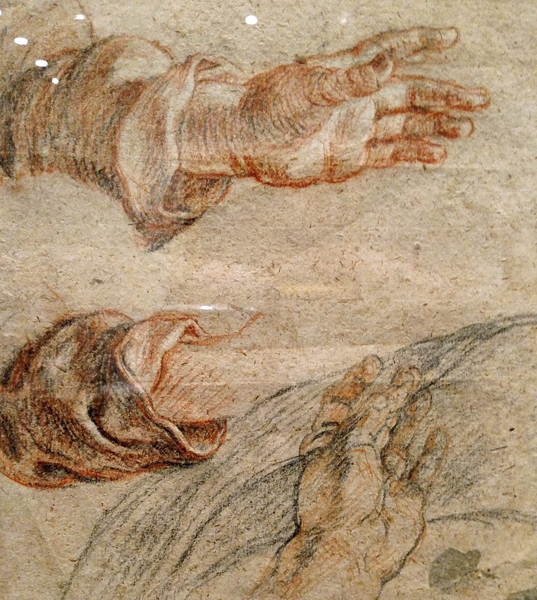 I don't have the artist for this sudy of hands, but it fits in with my deliberate practice "drawing hands" and I just wanted a copy! 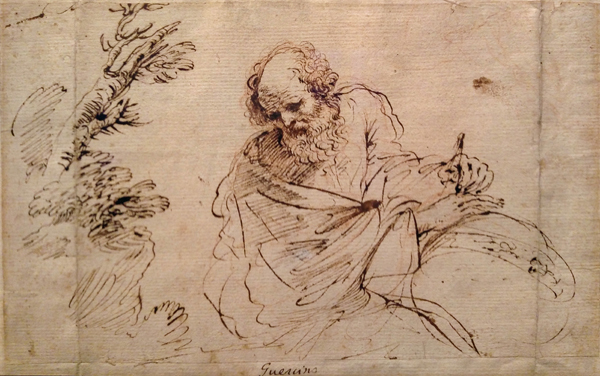 Il Guercino (1591-1666): Cosmographer with an Astrolab and Compass in a Landscape ($20,000). He is one of my favorite artists since I saw an exhibit of his drawings in London in 2006. 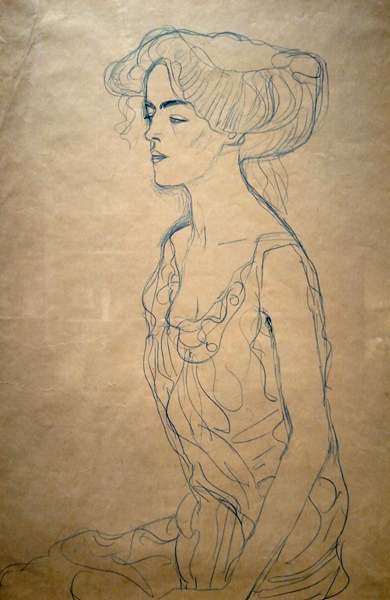 I copy his drawings whenever I see one in an exhibit here in NYC., but there wasn't time on this visit. Richard Diebenkorn (1922-1993) : Untitled. 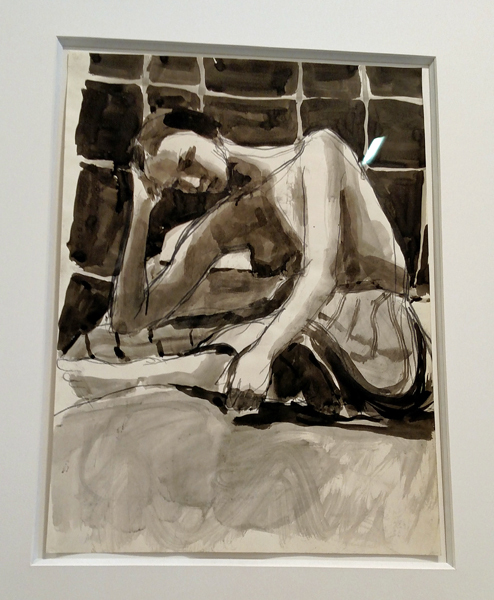 I love his figure drawings, and not his abstract paintings. Our last stop was at the Academy Mansion (2 E63rd St). There were 4 galleries renting space in the Mansion for Master Drawing week, and it is an amazing building that was built as a private residence in 1921, donated to the National Academy of Science for 20 years, and now owned by a real estate conglomerate - and rented out for film shoots and other events. This annual gallery hop never is disappointing. It is so hard to imagine seeing the inside of so many townhouses on the Upper Eastside and such wonderful varied collections of drawings. I just chose to include a few of my favorites in this blog post. Below: A David Hockney drawing (Peter Running 1968) used on a gallery banner. 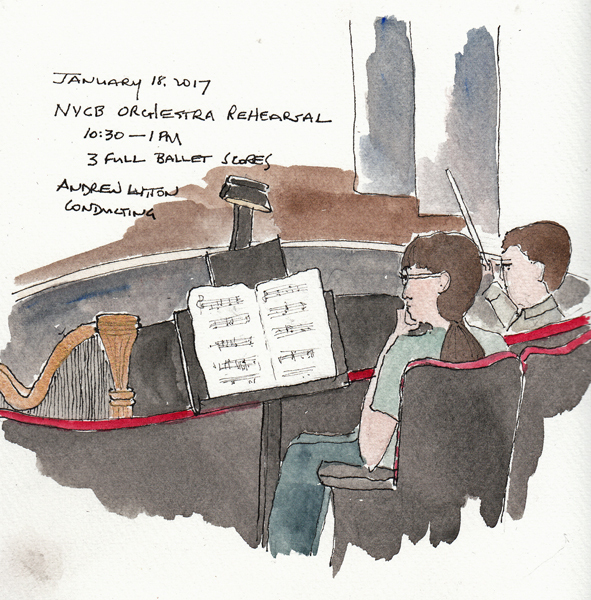 Last week my husband and I went to the NYCB working rehearsals 3 days in a row. These are offered as part of becoming a FRIEND of the ballet company and they are amazing! On Wednesday we listened to Andrew Litton conduct all of the music for 3 upcoming ballets. 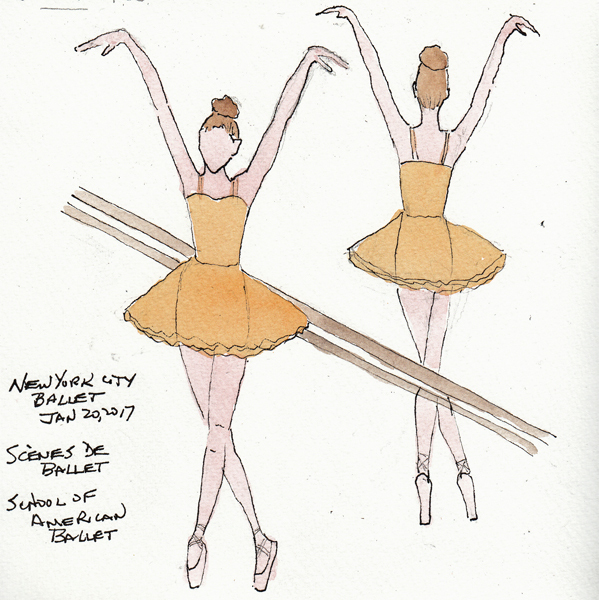 On Thursday and Friday we watched two 2-hour working rehearsal sessions of ballets being performed this week. 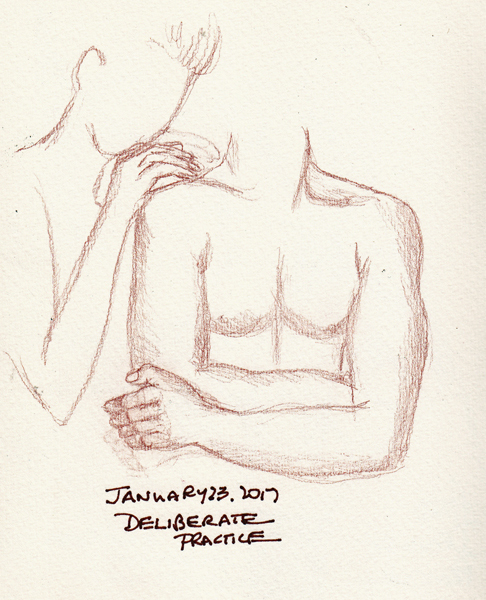 I try to do a sketch each time I'm there, but the lights are usually too dim. This is a sketch of an assistant conductor following along in the score (left) with just a glimpse of Andrew Litton conducting. The full orchestra was in the pit, but I could see the very top of the harp. 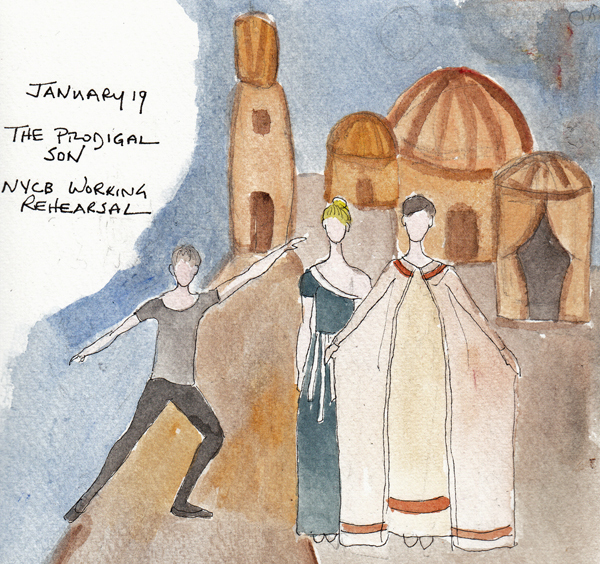 The Prodigal Son Ballet - several dancers were in costume, on the stage, before the lights went down. A full dress rehearsal with orchestra of "Scenes de Ballet" - a wonderful ballet danced completely by students from the School of American Ballet. The sets were gorgeous and the students amazing. The choreography depicts a Russian ballet studio, with a very long barre diagonally in the middle of the stage. Dancers are in pairs, with one on the left of the barre, and then another dancer on the right side pretending to be the mirror image of her. The precision was extraordinary. The auditorium was completely black when the curtain went up, so I memorized one dance position, and then sketched the dancers at home, reversing one to get the mirror image. It was really hard.